This is the first gown that I made. 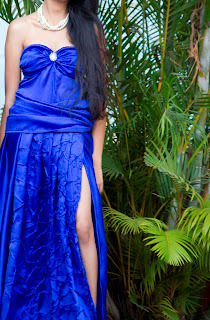 It is a strapless dress in a shade of blue. There is a brooch embellishment on the bodice and thigh high slit. The front of the gown, is covered with embroidery. Its a random pattern work that I did by hand. You did a great job with this gown! I love the fabric and the color and it looks very glam! Ooooh, gorgeous color! :) It really shines. Amazing dress, I love it! The gown is really amazing!! I like this dress so much! This is such a cool post! Well, what do u think about follow each other? Just if you like my blog 2. Absolutely stunning!! Congrats, what an amazing accomplishment! Wow this is beautiful,and your first made dress,wish I could sew like that now! 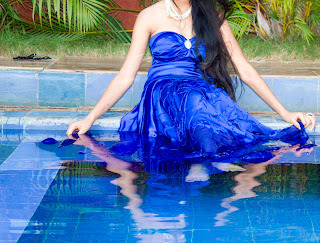 I love how you wore the dress in the water,looks beautiful like the dress becoming water. OMG! That dress is gorgeous. You did a wonder job. I love the color and the design also beautiful photos. Wow that is pretty amazing that you made this dress! I love the color, such a beautiful shade of blue.